Day 2 of the Celebration of Light fireworks competition in Vancouver featured Spain on August 3, 2011. I love photographing fireworks and tried out the focus blur technique for some of the shots and got some cool effects! I put the camera on a tripod and set the shutter speed to bulb, the aperture to f/9.0 and used a remote control to trigger the camera. I first focused the lens and noted the position of the focus ring, then unfocused the lens drastically. I waited until I saw some promising looking fireworks being launched, and triggered the shutter. I then focused the lens to the original position as the fireworks exploded. The technique creates wide lines of light that gradually narrow giving a flower-petal effect. Here are some examples from the Flickr focus blur group. The trickiest part is to avoid excessive movement when focusing the camera to prevent shaky lines. Timing is crucial and many of my shots didn't quite work out, but I did get a few nice shots! Check out my earlier post on Day 1 - China - July 30, 2011. The Vancouver 2011 Celebration of Light fireworks competition kicked off last night with a fantastic show by China. This is the first time that I have shot fireworks with my Olympus E-30 camera and it worked great. I was able to try out some focus blur techniques with this camera. Focus blur involves gradually changing the focus during the long exposure so some of the image is in focus and some is blurred. It can give some every cool and unusual fireworks photos. My previous camera, the E-510 was not able to change focus during the exposure, so I couldn't try out this technique before. For this shoot, I started with the camera in focus and gradually moved out of focus during the exposure. Next time I will do the reverse - start out of focus and gradully focus during the shot. 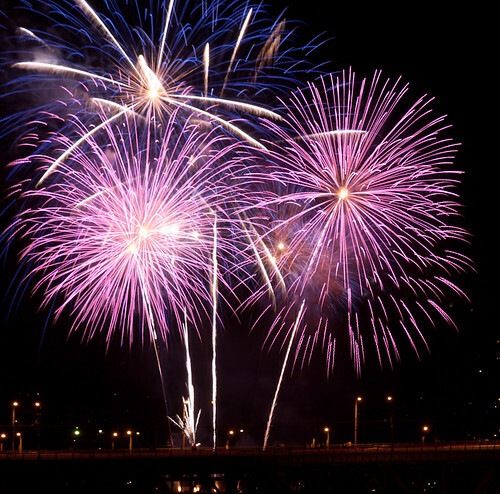 Here are some more tips on fireworks photography. On a related note, check out this tour of the fireworks barge before the event from Miss 604. Some of my favourites from last night are posted in the gallery below. I didn't use focus blur for them all - I wanted some straight fireworks shots too! 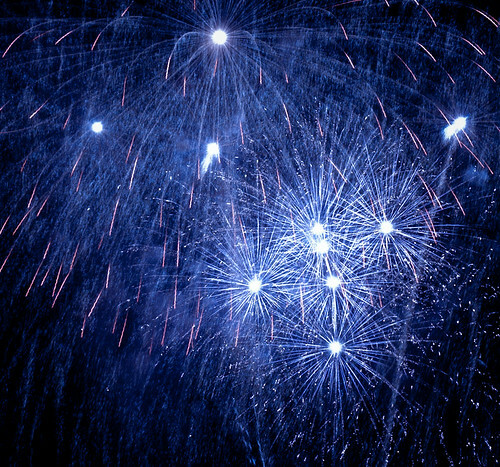 The next fireworks competition will be on August 3 with Spain putting on the show for the night. Feel free to share links to your fireworks shots! The 2010 Celebration of Light fireworks competition got underway last night with the entry from the USA team. This year USA, Mexico, Spain and China will be competing. Fireworks, with lots of light, colours and motion, are a great subject for photographers. I'm amazed at the incredible details of the plumes of light that show up in the photos, even though the fireworks last only a few seconds. Use a tripod. You need long exposures (several seconds) and holding the camera by hand will cause the images to look shaky. If you don't have a tripod handy, look for a spot that you can place the camera. Use a cable release - this also prevents camera shake. Exposure: 4 seconds at f/8.0 works well (ISO 100). You can play around with the exposure - usually you'll want a long enough shutter speed to capture the trails of light, which is about 4 to 6 seconds. Use manual focus. You can prefocus on some bursts and then keep the same focus for the subsequent shots. Try focus blurring - this is a little tricky but the idea is to change the focus during the exposure to give some interesting looking shots. Check out Focus Blur group on Flickr for more details. Try setting the camera's shutter on "bulb" and covering the lens with a black cloth (in a pinch your hand will do). When a particularly dramatic explosion happens, you can remove the cloth for a couple of seconds and then cover it and wait for the next one. After 2 or 3 bursts you can close the shutter. I prefer to shoot in RAW format and adjust the image later using Lightroom (or any other raw image editor). Try different white balances - tungsten usually looks pretty nice!